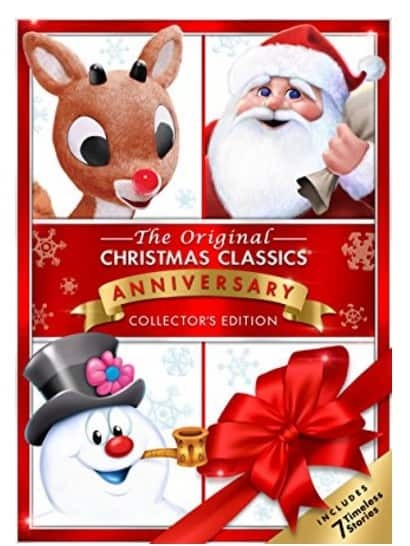 The Original Christmas Classics Anniversary Collector's Edition on DVD is on sale right now for $7.96 at Amazon. That's 68% off the list price of $24.98! It is also available on Blu-ray for only $14.97! Includes 7 Holiday Favorites: Rudolph the Red-Nosed Reindeer Whos got a nose for Christmas? Rudolph the Red-Nosed Reindeer! Just in time for the holidays, here comes Rudolph in the most beloved special of all time! Packed with a sleigh full of memorable songs and unforgettable characters, Rudolph the Red-Nosed Reindeer lights up the hearts of young and old alike. Santa Claus is Comin to Town Where does Santas suit come from? Why does he slide down the chimney? Why does he live at the North Pole? The answers to all these questions and the origins of our favorite holiday traditions are revealed in this delightful classic about Kris Kringle, the world s most famous gift giver. Frosty the Snowman Look at Frosty Go! Whats become a bigger holiday tradition than building a snowman? Watching the original Christmas classic, Frosty the Snowman! Grab your scarf, bundle up, and get ready for the incredible adventure of a magical snowman whos got enough personality to win over the whole family. You can t go wrong with Frosty! Frosty Returns Mr. Magoos Christmas Carol Bah Humbug, Mr. Magoo! In this first-ever animated holiday TV special, the bumbling and loveable Mr. Magoo is Ebeneezer Scrooge in a hilarious and heartwarming musical retelling of Charles Dickens classic, A Christmas Carol. The Little Drummer Boy This story has touched the hearts of families everywhere. In this holiday classic, the true spirit of Christmas is revealed when a lonely orphan stumbles upon the birth of the baby Jesus and affirms what the holidays are really about giving and love. Featuring a beautiful soundtrack by the Vienna Boys Choir, this timeless tale of generosity makes the perfect addition to your holiday collection. Cricket on the Hearth A delightful, animated musical version of Charles Dickens classic tale, Cricket on the Hearth, tells the story of a poor toymaker and his daughter whom a helpful Cricket named Crocket befriends on Christmas morning. When tragedy strikes the family, it s Crocket who comes to the rescue and restores peace and happiness.